Will Americans ever experience true firearm freedom? A bill to let Tennesseans carry guns in the open without a permit was voted down Monday night in committee. Members of the committee heard arguments against the bill from the governor’s top safety official, and in the end voted 10 to 1 not to let Tennesseans openly carry guns without a permit. According to Nashville Public Radio, Van Huss (R) who sponsored the bill said that the bill finally got a fair shake before it was voted down, so he won’t force the open carry issue any further this year. Michael Lotfi reported that Tennessee law makers killed a pro-gun bill last month. A bill that would nullify any federal ban on firearms. See here. Will Americans ever experience true firearm freedom? Will the 2nd Amendment ever be restored as the founders intended? South Carolina experienced a blow to 2nd Amendment Rights this year when a Republican majority killed a bill that would allow citizen to carry a firearm without a permit. In South Carolina, if you feel that someone is stalking you after work, you cannot protect yourself with a firearm. You will first have to get permission from the government, pay for an expensive class, pay for a permit and wait for more than 90 days to get a concealed carry permit. So if you feel threatened, you cannot defend yourself with a firearm for at least 90 days. Both South Carolina and Tennessee are violating the 2nd Amendment. They are infringing on our right to defend ourselves – the God-given and natural right to keep and bear arms! What are your thoughts? 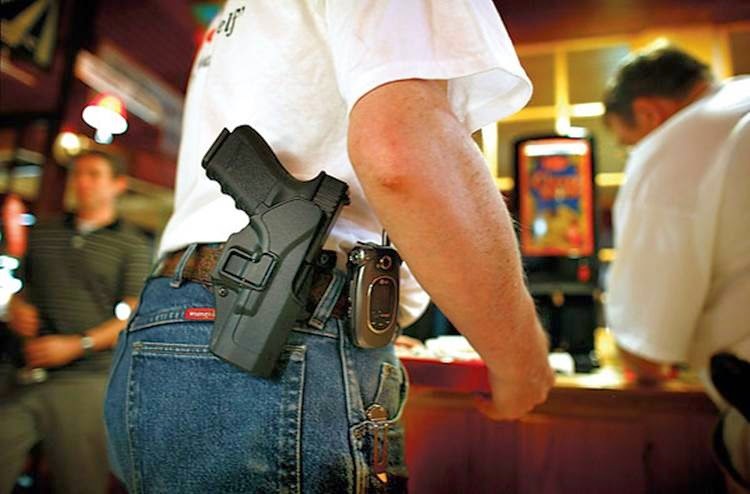 Should we have to get the government’s permission to carry firearms?